Iqrar-ul-Hassan second marriage with anchorperson Farah Yousef. 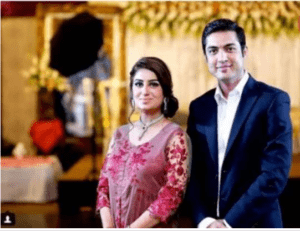 He shared a picture of Iqrar ul Hassan wife (Farah and Qurat-ul-Ain) and Iqrar ul Hassan son (Pehlaj Hassan) on social media site (Twitter), where he exposes the secret of his second marriage. He was on a foreign trip with his family. Iqrar-ul-Hassan is a legendary anchor who got popularity from a very famous show sar e aam where he is not only performing his duty but also for the betterment of the society. He was married to an anchor girl Qurat-ul-Ain and they have a very cute son, Pehlaj who recently becomes a star.Celebrity life is not easy at all. Everybody wants to know each and everything about celebrity even about their personal life. When fans came to know even a minor information about celebrity, it spreads like flames and whispering about the topic makes it more heartbroken. Recently, Iqrar-ul-Hassan was on a family trip with his family. Where he posted his picture on twitter. In one of his picture, Farah Yousef was standing behind him which creates a bundle of questions for him. Everybody start criticizing Iqrar-ul-Hassan about this. One of his fans commented that, is Farah Yousaf Standing behind him, which he answers “Yes” without any lie. Here Iqrar-ul-Hassan second marriage truth revealed. Another Person asked for the explanation about this which he replied “explanation about what? Farah Yousaf is my wife and with me on a trip”. In this way, the biggest truth of his life revealed. After that Farah Yousaf also twitted by saying Thanks to Iqrar-ul-Hassan for giving her respect. A few hours later, Iqrar-ul Hassan shares the picture on social media by captioning “My both wives and son”. By the pictures, it can clearly be seen that his both wives were sitting together and there is no clash between them instead they are much happy. No one knows when they got married and why. There is a bundle of questions in the mind of many people but it’s totally personal question. Iqrar-ul-Hassan doesn’t want to reveal it. It’s obvious that we should restrict our self by criticizing any person. But I appreciate the courage of Iqrar-ul-Hassan that he replies positively to his fan without bashing on them. We have no concern about Iqrar-ul-Hassan second marriage, but he is bet anchor and a human who is doing well being of society.